There was an unfortunate episode in yesterday’s one-day cricket match between New Zealand and England. England took advantage of a collision and injury to a New Zealand batsman to run him out. This is equivalent to scoring a goal whilst holding down the goalkeeper. England declined to recall the batsman. The umpires declined to take responsibility and declare a dead ball which would have cancelled the act. And so the destructive characteristic within man's ‘will to win’ combined with officials' timidity to prevail over fairness. "We do not want to do further damage to the Zimbabwean people, but when businesses are helping the Mugabe regime, they should reconsider their positions." The UK's Prime Minister deserves praise for a classic piece of hollow political umpiring. Simple words, impossible definitions and pass the buck all in one sentence. But in case anyone accuses him of prevarication on a difficult issue only last week he was firmly against stripping the now Orwellian figure of Mr Mugabe of an honorary knighthood the UK gave him in 1994. This on the grounds that it would be a mere symbolic measure. Some declarations are beyond ridicule. But let it at least be said that Mr Brown’s political antennae are not good enough to keep him in his job beyond the next election (due by summer 2010). 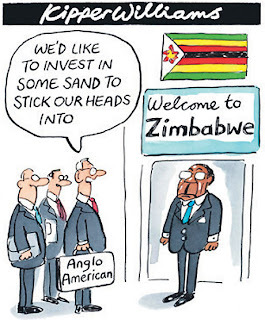 International businesses involved in Zimbabwe such as UK quoted Anglo-American and WPP plc find themselves caught between the search for profit and the desire to be considered moral entities. Both groups have somewhat sheepishly defended the do-nothing gambit. Their dilemma is not enviable; nor their reaction unexpected. But the beyond-our-control rationalisation is a piss-poor choice that most would be ashamed to teach a son or daughter. In 2004 Australian cricketer Stuart MacGill declined to tour Zimbabwe on moral grounds. It was a brave decision despite the career risk and knowledge it would change nothing. A similar dose of (belated) political and commercial decisiveness on the other hand would produce results. Such, possibly, as the free and fair elections taken for granted by so many. Footnote: New Zealand won yesterday’s game in an refreshing demonstration of natural justice. But that’s sport.